Thankfully I had the camera ready this time, rather than the last one (which vanished). Nice bird eh? We have high hopes for tomorrows birding. You honestly never know in migration, but it is a warm front. To finish up, Ken's continued Pelee Island postings... I feel like he should be getting more credit for this blog than me, but it's good filler while I try to stay awake before crashing each evening. Another pretty good day, considering its the last day of April! Close to 120 species were seen on the island. Summer Tanager - 1 adult male, giving 'cracking' looks! ~200m. south of the East-West Road on Stone Road, picking up worms from the road! 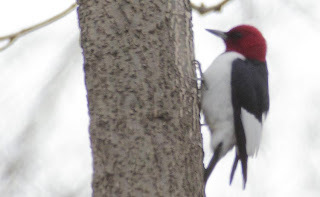 Other interesting birds around, included; Red-headed Woodpecker, Orchard Oriole, Ruby-throated Hummingbird and Blue-winged Warbler. Wind at lighthouse point (strong SE) and Mike Burrell. Here's hoping for tomorrow! Similar conditions to the fallout last tuesday? Time will tell! It's amazing how birding all day for multiple days (early to dusk) can make you exhausted. It's not even 10pm and I'm having a tough time keeping my eyes open! Things are looking ok tonight (Saturday) and possibly pretty good for Sunday... You honestly never know in spring though! Another pretty good day. Brandon and I birded throughout the island and had about 115 species. Cerulean Warbler - 1 male at Middle Point and another male at Fish Point - brings the total to 4 individuals seen this year, so far!! 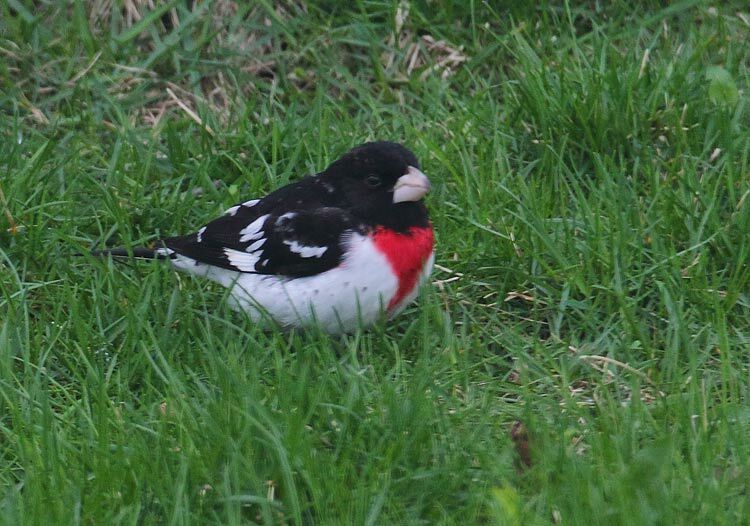 Other interesting species seen included; Pied-billed Grebe, Merlin, 2 Blue-winged Warblers, (2) Red-headed Woodpeckers, several Indigo Buntings etc. Another great day! The wind was the main story, being incredibly strong. Brandon Holden and I birded the island today and found some good stuff. 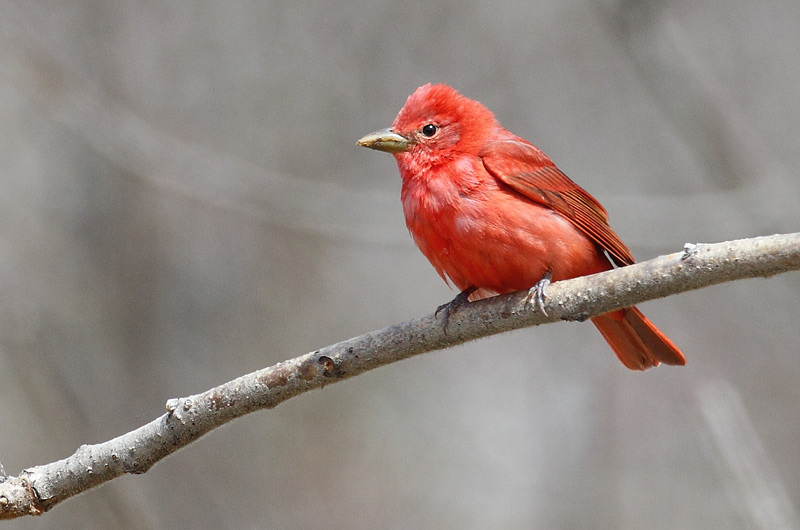 Summer Tanager - 1 adult male at Lighthouse Point - this bird was associating with an adult male Scarlet on the beach!! Other interesting migrants seen included; Swainson's Thrush, Red-headed Woodpecker (4), Orange-crowned, Blue-winged and Blackburnian Warblers. 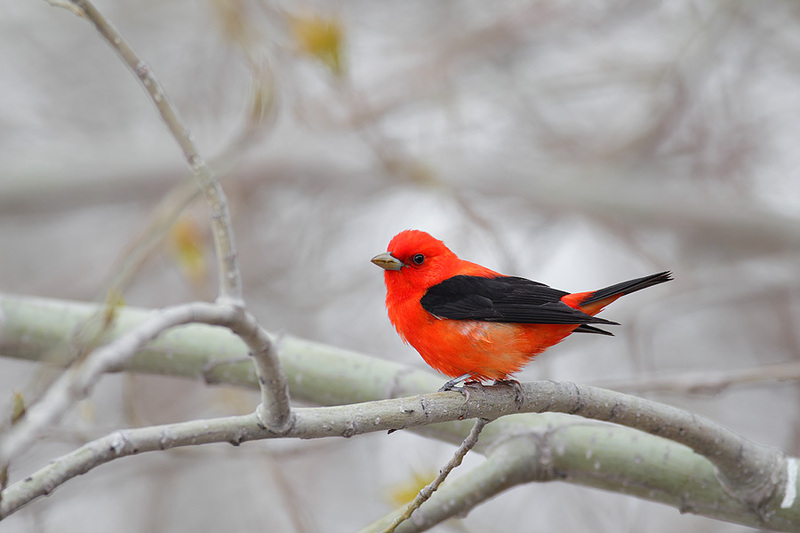 Of course the Summer Tanager had to leave before the cameras arrived, but I was happy with the Scarlet photos I got.. This is an early favourite: full frame too! Scarlet Tanager. Bittersweet after the adult male Summer Tanager it was with, vanished at the sight of our lenses appearing. Not bad for having the camera out today for about an hour!!!!!!!! These are the "record" shots.. I actually got a few high quality shots of the Tanager as well. Both Ken and I ended the day with 201 species for Ontario (so far this year)! Vicious winds at fish point!!! Another cyclonic low pressure system to blow in more rare birds! 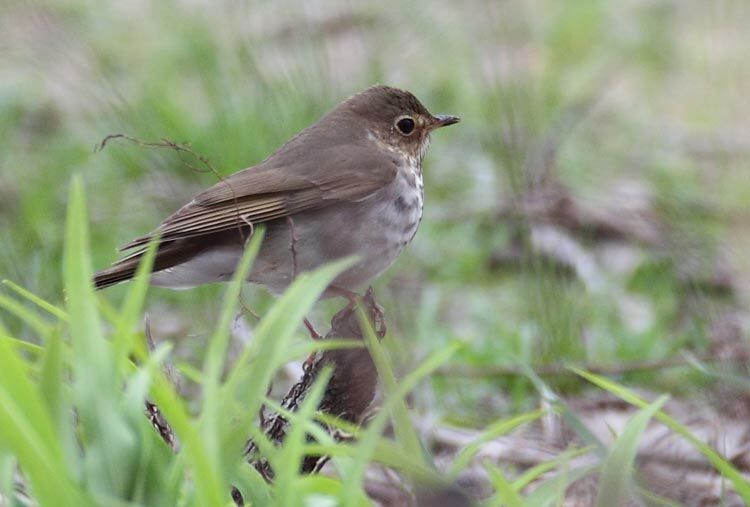 Apr 27 update: Arrive at Pelee Island, find crazy rare birds. Well today was well, pretty much awesome!! Maybe not as high of numbers like yesterday, diversity was definitely still VERY interesting. Brandon Holden met me on the island at 11:30am and we blitzed the island until dusk. Again over 110 species were seen on the island - not too bad for April. 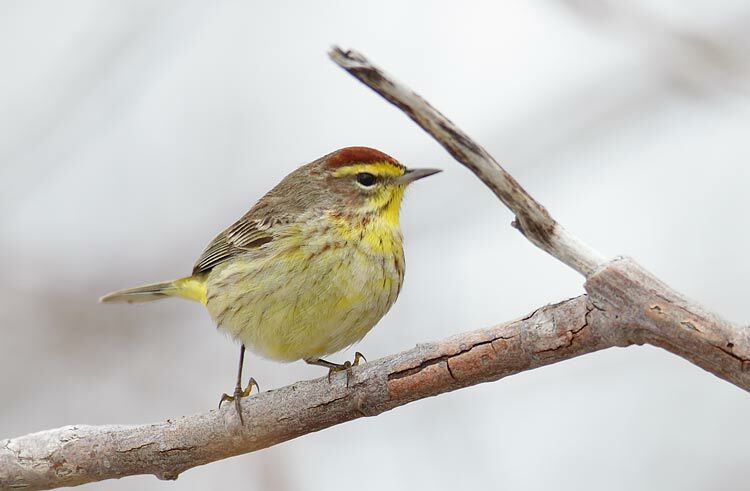 17 species of warblers. Glossy Ibis - 1 seen flying south at Sheridan's Point at 2:50pm - seemed to be actively migrating along shore and having trouble with the wind! Great looks! Yellow-throated Warbler - 1 male seen and heard at 'the bowl' at Lighthouse Point - this bird gave 'face-melting' looks at point blank range for over 5 minutes! Acadian Flycatcher - Graeme Gibson had 1 bird at Fish Point this am, seen very well - same bird as yesterday??? 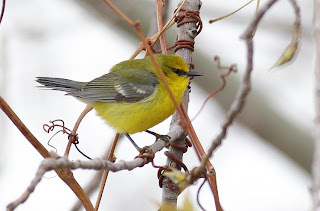 Other interesting birds seen included: N. Parula, Orange-crowned, Blue-winged, Cape May and Chestnut-sided Warblers, Red-eyed and Warbling Vireo's. Addendum to yesterday: Dean Ware had a singing Prothonotary Warbler at Fish Point. Directions: Please email me privately, thanks. Woke up at 550am on what felt like little to no sleep! I had a pectoral sandpiper and a Yellowlegs sp. 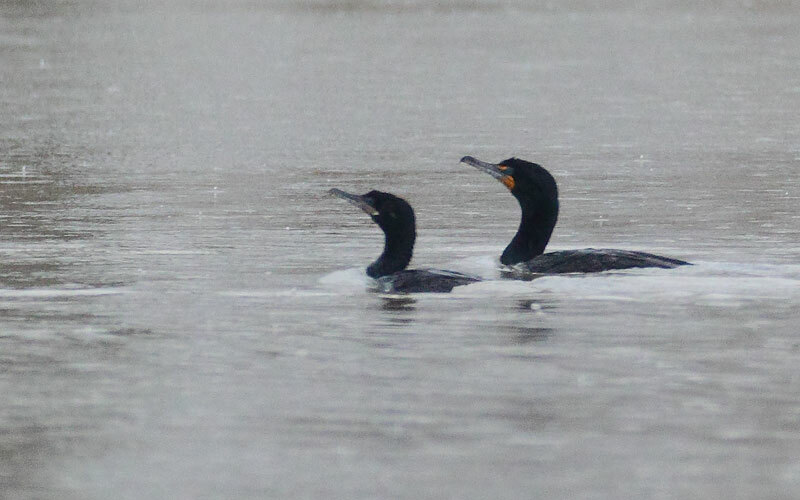 fly over the tip area in the rain, so I'm thinking this afternoon/evening could be good for shorebirds. The forecast calls for 50-70kmh S winds, which could be good for Marbled Godwits, Avocets and Willets later today! Currently drying off after the thunderstorms as I wait for the Pelee Island ferry! (10am) hopefully the rest will pass while I'm on the boat. Here it is, 210am.. I just drove from guelph to sleep here. (I always do much better driving late than waking up early). The wind is fairly strong from the south and its 15C.. Overshoot weather if I ever saw it! I may have just smelled a Blue Grosbeak flying over, but I probably won't count it. The plan is an early visit to the tip for 2 hours, then to the Leamington ferry dock to Pelee Island!! I'm going to go crazy for the 3 hours of lost time, but hopefully it will all be worth it. 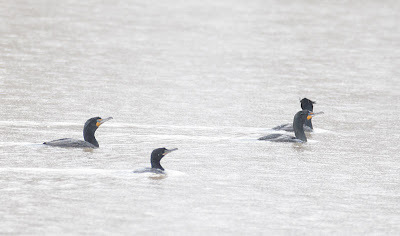 The blog is undergoing a transformation, where I will try to pots mini-updates of the spring migration on Lake Erie (from my phone), rather than try and do real blog postings without any time, sleep or internet to help me. I hope regular followers of the blog can deal with a rash of these mini-postings for a while! Things will get back to normal later in May. 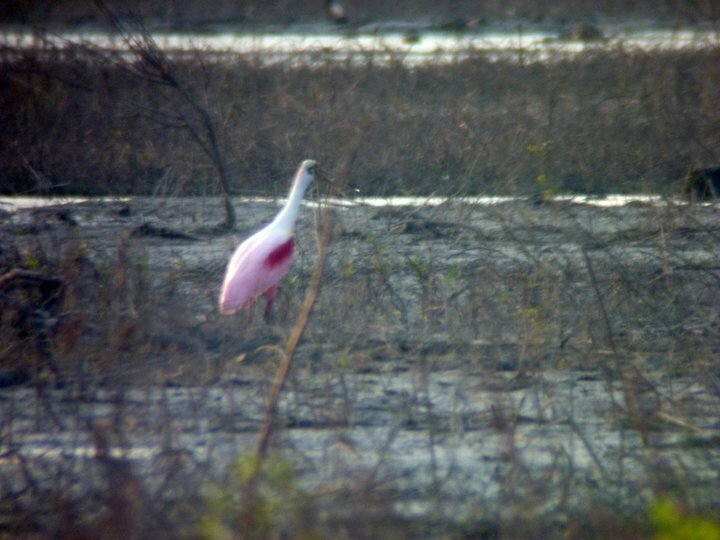 Tricoloured Heron, Snowy/Cattle Egrets, Black-necked Stilt, Yellow-headed Blackbird (and more!) on the south side of Lake Erie. 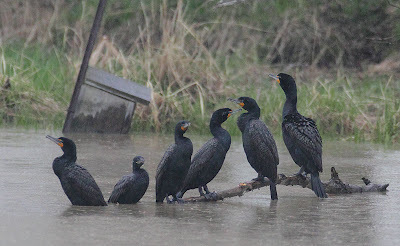 Not to mention the rash of rarities in Ontario *cough* Neotropic Cormorant, Eared Grebe, Eurasian Wigeon, Cattle/Snowy Egrets, Willets, Avocets, Marbled Godwits, Yellow-throated Warblers, Townsend Solitaire, Black Vultures. "It's the happiest season of them all"
Andy William's - you may not have known he was a birder, and that they remixed his "spring at pelee" song to a Christmas song in order to make some fast cash. 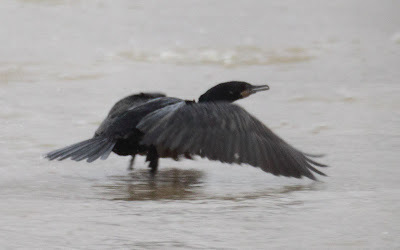 Finder's Account of the Neotropic Cormorant! 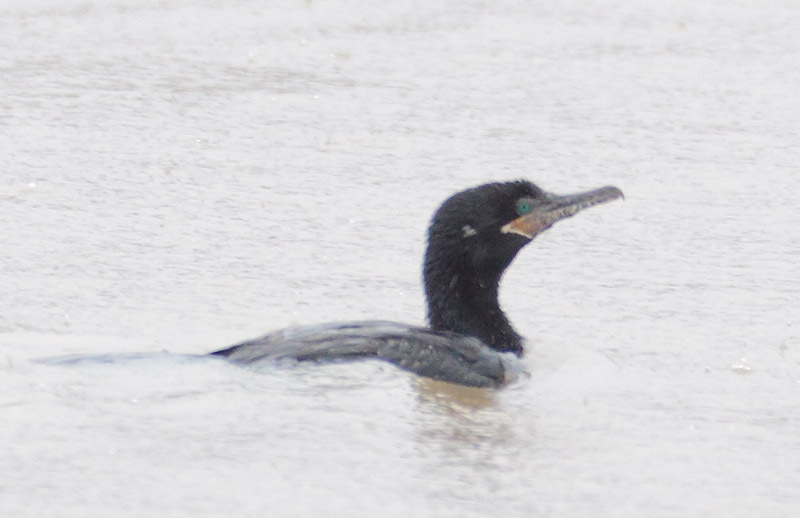 Ken: " I've never seen anything rare at Wheatley Harbour"
Me: "You didn't see the Slaty-backed Gull / Ivory Gull / Neotropic Corm here a few years ago"
Me: "no, neither did I"
Ok yeah that's a Neotropic Cormorant. woo! (insert usual rare-bird finding excitement here). 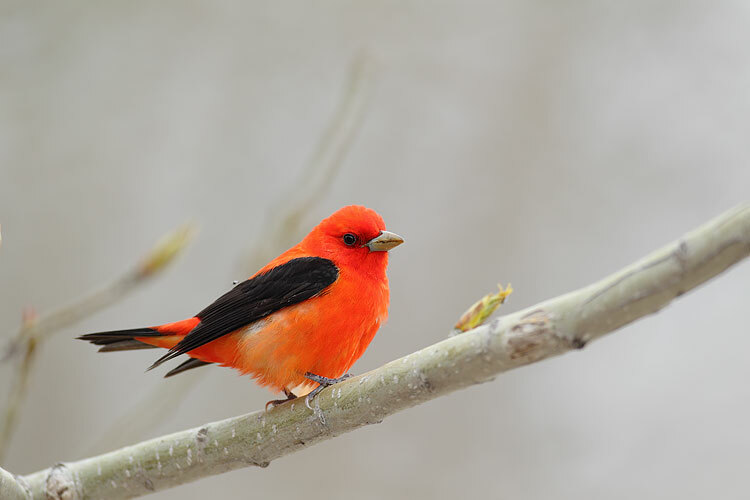 I set to telling my lovely girlfriend, my parents and then the birding world about the presence of the bird. Cr@p! They all just freaked out and jumped in the water! Oh thank god, they're all moving back to the first branch. Hey look, the Neo-corm is fighting with the others for a resting space. This is great... But man do I have to go to the bathroom. I bet if I drive up behind that big evergreen tree, I can go to the bathroom before anyone else arrives, and the cormorant won't be able to see me there. So yeah, there you go.. An excuse to post some more photos, and tell I story I would never have admitted to if the bird wasn't hanging around for all to see! Editors note: I wrote this a few days ago, but given all the rarities and birding news, I figured I'd just post it now and move onto bigger and better things tomorrow. ! Including my photo collection of the Cormorant and rarity news. It's that time of year again where I start looking at crows more closely. 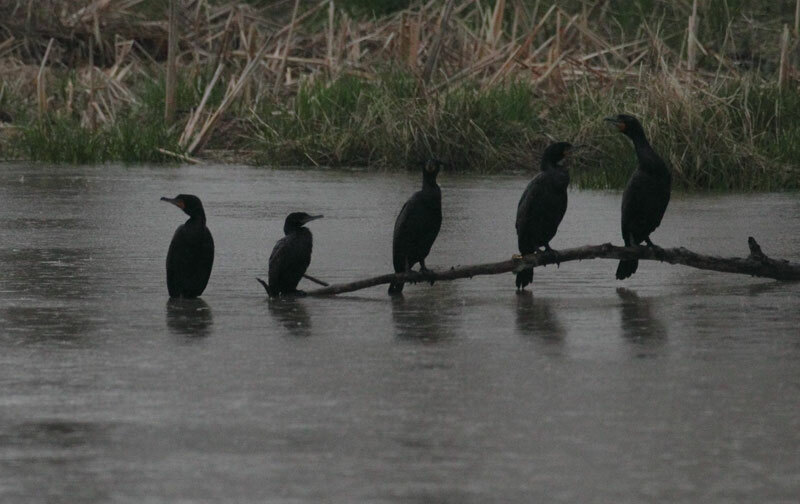 I know many a birder who has Fish Crow on their Ontario list, but I'm not one. 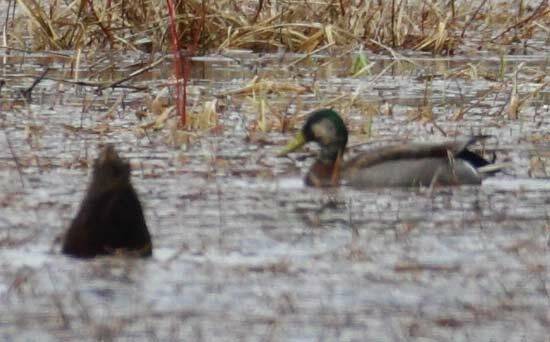 The length of the 5th and 6th primaries (compared to each other) is dramatically different between the two species! ha... It's actually more than just a bad joke. Most "late migrant" crows i've photographed around Pelee and elsewhere in April and May have TERRIBLE looking flight feathers. 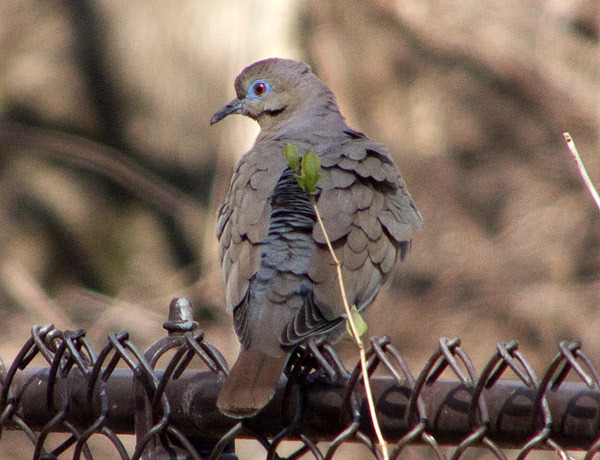 They must be year old birds (retained Juvenile feathers) and in desperate need of molt! Are there really more Swan Geese in Ontario today than 2 years ago? Or have I just finally learned how to "pick them out" from the masses? Odd American Black Duck x Mallard Hybrid.... Just a record shot of a bird a few days ago that had a strange head pattern (green all the way around the head, but a brown circle in the centre). Bad weather grounds migrants! This Great Egret was looking out of place in a farmers field during some of the terrible cold weather we've been experiencing over the last few days. Arrived home asleep last night, and am now off to work. Better photos of this bird tonight! Neo Corm Photo try 2! Well I've made a last minute decision to head to Bright's Grove (near Sarnia) rather than Pelee... Why? In search of hawks! Hopefully I'll have lots to report from there! 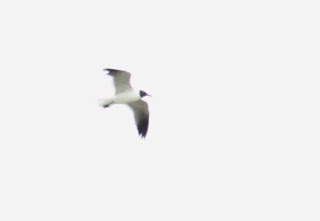 Adult Little Gull in breeding garb. One of the most stunning birds in the world, in my opinion (a better photo would do it justice) but who else has a LIGU and a turbine blade in the same photo? Short-eared Owl totally ignoring some turbines... All this extra wind we're making is really going to help blow in more exciting rarities than ever before. Broad-winged Hawk from one of those nice days in April we've had. I wonder if the birds are as annoyed with the weather as us. When do they migrate? One of 4 Coyotes that I saw on my "big coyote day". 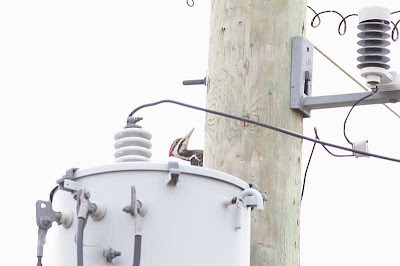 Female Pileated Woodpecker nesting in a telephone pole.. I wonder what the hydro guys think of this! But seriously, while out bir-work-ding yesterday we had 50ish Bohemian Waxwings just north of Lake Ontario. Last Saturday I had 80 fly over the 401 near Coburg. 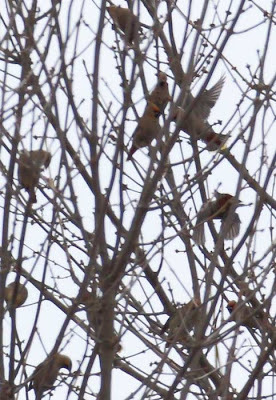 Earlier sightings in Guelph of 100+ birds.... 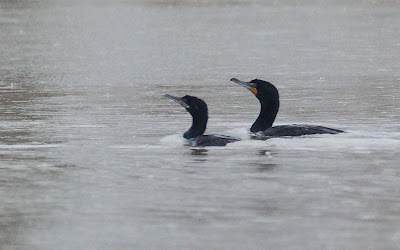 Normally Bohemain's make their "Return flight" from the east in early April.... Yet now I'm seeing 50+ on APRIL 21ST!!!! How long are they going to stick around? 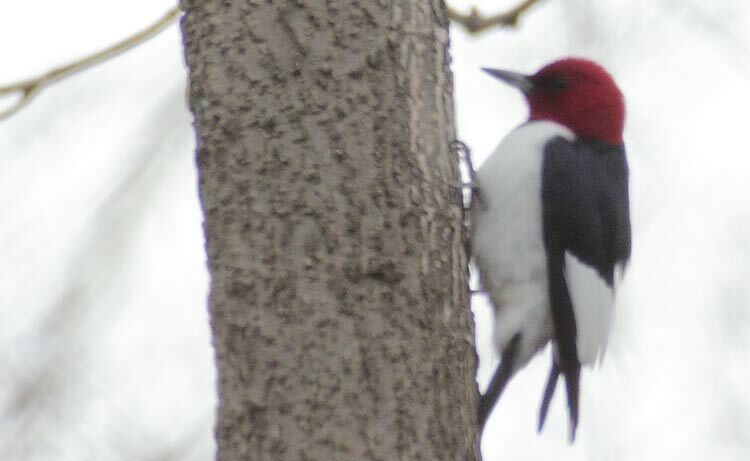 I've probably seen at least 30 Cacklers this spring! (After 25 at Townsend) -- I sure wish I had my camera that evening. My hear tells me I can't wait any longer! 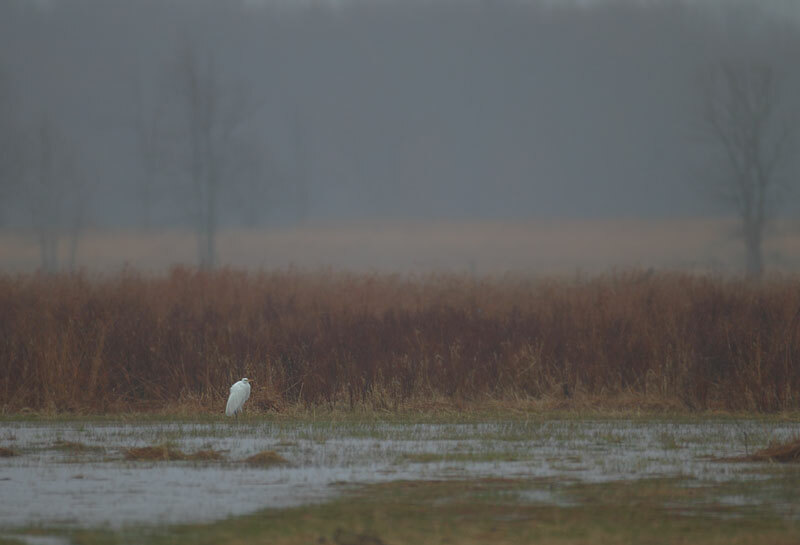 And with rarities in Ohio (Eurasian Collared Dove, Black-necked Stilt, Snowy Egret etc), there could very easily be some awesome birds around Pelee. You won't find anything unless you're out looking! Ever since phase 2 of the revolution (I'm not sure if that's the right phase, but I'm guessing no one else does either), where I decided to pull back on the focal length (not using teleconverters as often = better focus/sharpness but 40% less reach), I've had birds landing in my lap. Newest candidate on the block is this Wilson's Snipe. Somewhat lacking in decent photos a year ago, I've had a few chances since then; and suddenly have a respectable collection. I literately pulled the car right up to this bird and started shooting, without a glance my way. He was busy calling and displaying, and let me grab about 30 shots before flying off. Finally got in on some of this spring rarity action. I can't tell you where, on penalty of something... But I think I'm allowed to share a few pictures. Sort of an odd sight on a sandy beach. I know I blab about the weather a lot, but I'm continuing to watch the weather for the weekend. These constant (la nina) storms should do something, and if the temps go to 15-20 degrees on the weekend at Pelee, I may just have to make the trip down. Time and internet are proving to be a bit more difficult this week, but i'll do my darndest. Not much time for bird news. It's that time of year where everyday outside can produce new species. This morning it was two beautiful Upland Sandpipers at dawn for me. Freshly arrived from Argentina, calling as they flew down from their nocturnal migration, landing in the field right beside me. Awesome stuff! American White Pelicans just about everywhere, including Mountsberg (between Guelph/Hamilton) and another at Cootes Paradies in Hamilton, and then a third in Brantford (Still)!. What is that thing, a Hurricane? I know we are probably a week early on when things can really start to happen, but storms like this are hard to ignore (especially when you're only a week away from when things usually really start to happen). It's going to be very interesting to see what sort of impact this storm (and forecasted storms soon afterwards) are going to have on migration and vagrant birds recorded. 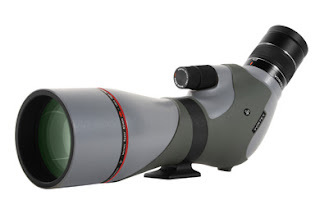 It's also starting to be that time of year where I will throw out occasional reminders about Vortex optics! Since I will start seeing high numbers of people again soon, I figured I should continue to extend the offer of Vortex optics (mainly the Vortex Razor spotting scope, pictured above) knowledge and hands-on information for anyone curious. Vortex is kind enough to let me use one of these incredible pieces of glass, and I spread the word about why its easily one of the best scopes ever built and sold. So yeah... When you see me at Pelee or elsewhere this spring. Come up and give the vortex scope a try, and I'll do my best to answer any questions you have about it or other vortex stuff... It's actually a pretty easy sell on my part, and I think you'll be impressed. I'm working away for the week, but found a rather cooperative Rough-legged Hawk a few days ago and spent some time observing and photographing it. The light wasn't really all that great, so I can't really decide how much I like these photos. Sometimes I think I just end up enjoying watching the birds, and therefore enjoy the photos, even if they aren't all that great. Weather is looking pretty stormy/crazy over the next week. Storms and wind can't be considered a bad thing when hoping for migrants and rare birds to arrive, but I guess we'll have to wait and see what happens. Northern Parula - 3 --- some decent images discovered in those files! Left on the b-side hunt is Shorebirds... Then sort/edit some stuff from Newfoundland... Then! (and only then) I may be in a reasonably happy place with the state of the website/photos etc. ! 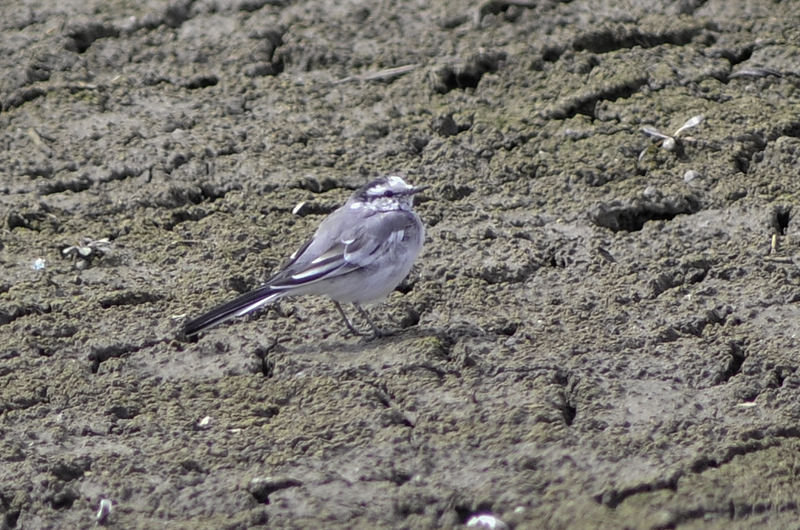 White Wagtail in Michigan.. Minutes from Ontario? 3rd time wasn't really a charm!